KAILUA-KONA, HAWAII – On Wednesday, March 15, 2017 the La‘i‘Ōpua 2020 Board of Directors including Executive Director Bo Kahui along with Kahu Iris Kunewa, dignitaries, representatives, contractors, engineers and friends of the Villages of La‘i‘Ōpua celebrated the groundbreaking for the building of their community center in North Kona. La’i’Opua 2020 recently completed its New Market Tax Credit (NMTC) financing for the initial 3,000 square foot phase 1 construction of the 13,000 square foot community center facility. 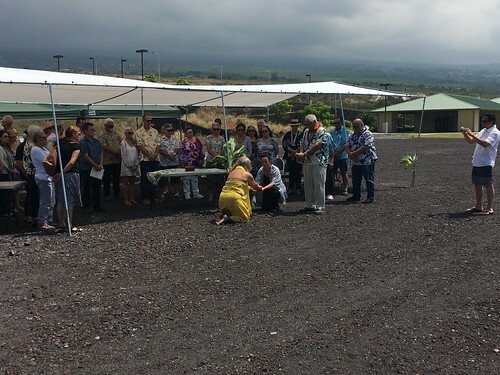 Once completed the community center will serve as a pu‘uhonua (area of safety and peace), the La‘i‘Ōpua Community Center in North Kona is vital to meeting the needs of Kona Coast residents. The center will be the primary regional resource for the Hawaiian people living both in the Villages of and throughout North Kona region. Offering an array of programs and services to meet most every health, social, educational and recreational needs of our people and surrounding communities. Serving as a model for emerging communities statewide, La‘i‘Ōpua 2020 and the surrounding communities will enjoy a pre-school, a community center facility, medical clinic, social service center, inter-generation daycare facility, abuse shelter, community gymnasium an aquatic center and an amphitheater. DHHL is proud to be a part of this exciting development and will continue to work closely with Bo, the Board of Directors and everyone involved to ensure this project is completed.